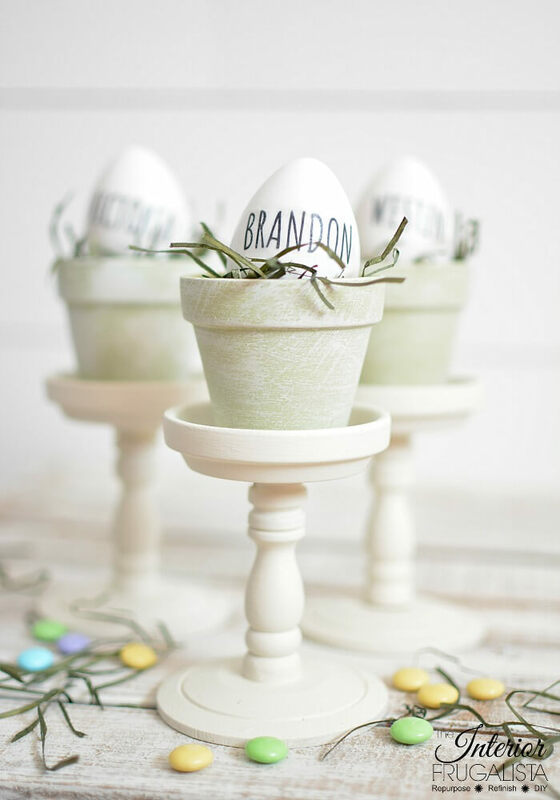 Do you like to dress up your Easter table with that little extra something to wow your guests? The centerpiece steals the show but adding a little pop of color either on top or beside the dinner plates is always a nice touch. 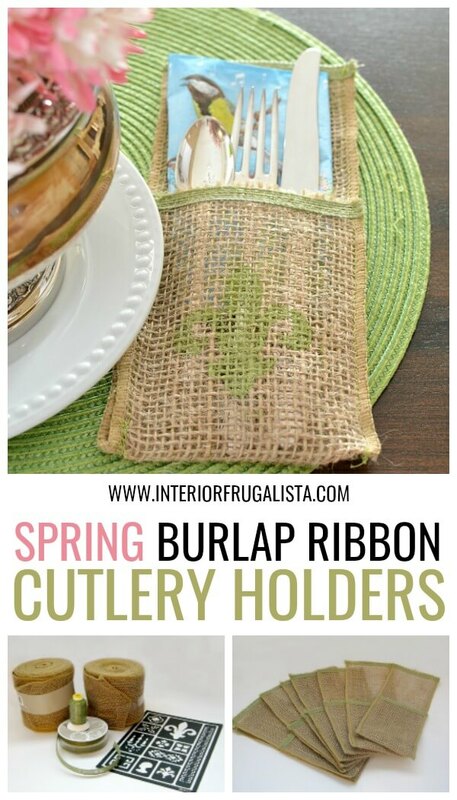 Today I'm sharing an easy tutorial on how to make Spring cutlery holders with burlap ribbon but they could be used any time of the year. You don't have to use burlap ribbon like I did, any wide ribbon would work. Which makes the possibilities for these endless. Depending on the stencil or the ribbon, you could make them for any season or holiday. What I love about these cutlery holders is that they are so handy to have for buffets, large gatherings, summer BBQ's or picnics, weddings, and of course to embellish holiday tables. 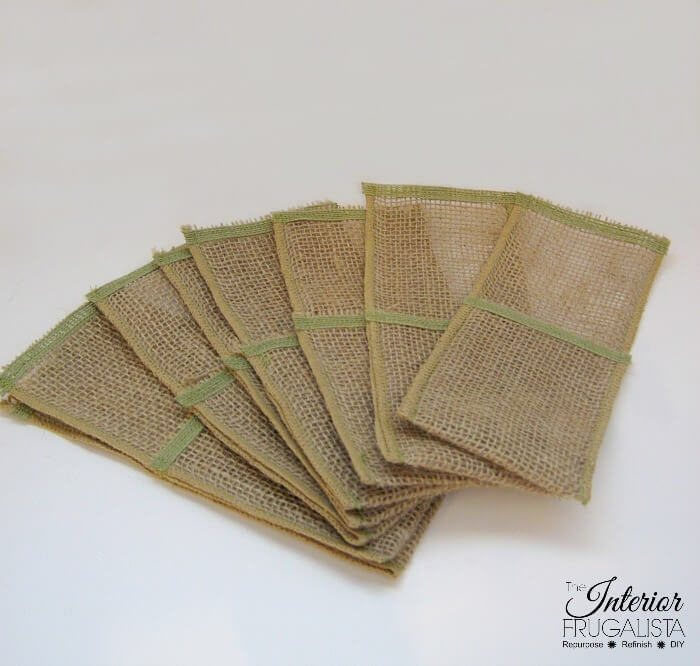 For the holidays I made a few different styles of burlap Christmas Cutlery Holders both for my dinner table as well as extra sets to give for hostess gifts. It's better to use the unwired ribbon because you will be sewing along the edges. Although you could make these without sewing by using no-sew fabric glue. 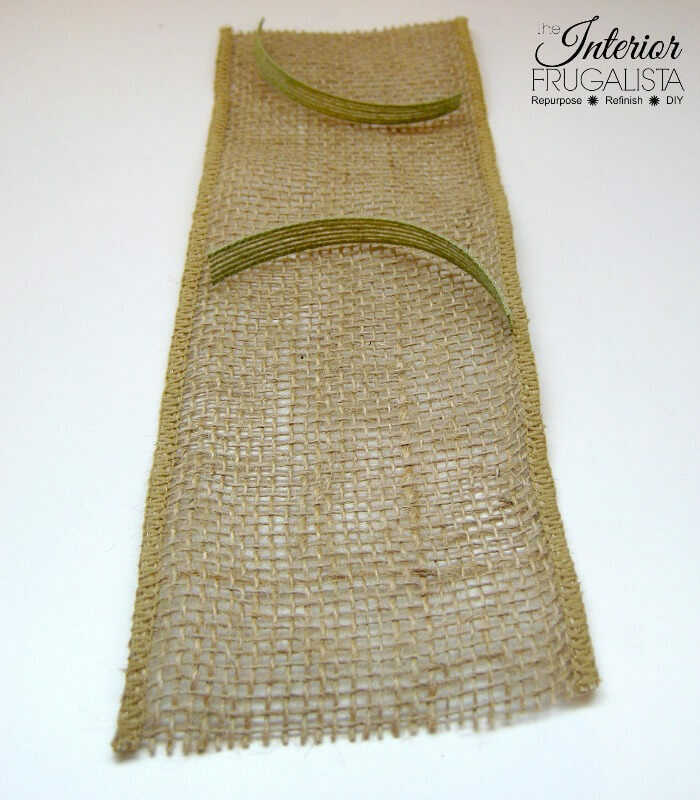 These cutlery holders are so inexpensive to make because oftentimes you can find the plain burlap ribbon at the dollar store. These are the supplies used to make the Spring Cutlery Holders. To mark the cut lines for each cutlery holder on the burlap ribbon spool, remove a strand of jute every 15 inches (like pictured below). I prefer making my cutlery holders in sets of eight but depending on how large your gatherings, you may want to make more. Cut the ribbon at your 15-inch markings. 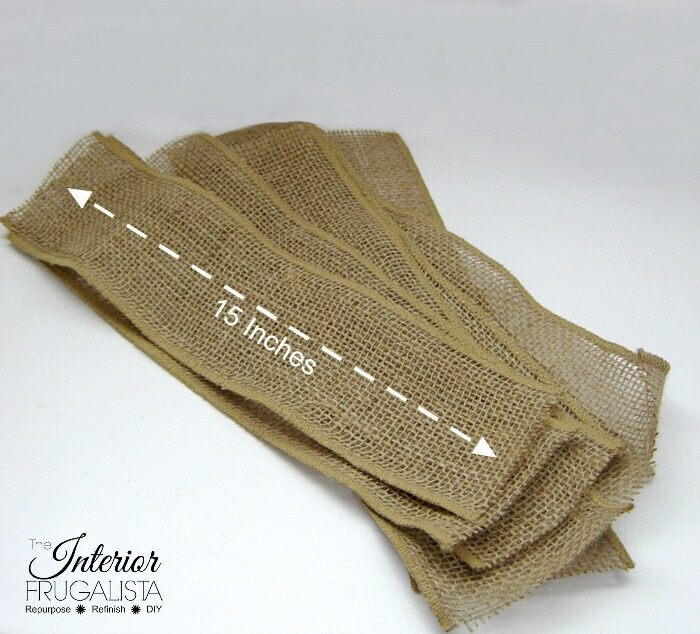 Cut strips of narrow decorative ribbon about 4 1/2-inches long, slightly larger than the 4-inch burlap. You'll need two per cutlery holder. I used 3/8-inch green jute ribbon to decorate mine. No worries if you don't have a sewing machine, you definitely can make these with no-sew fabric glue. 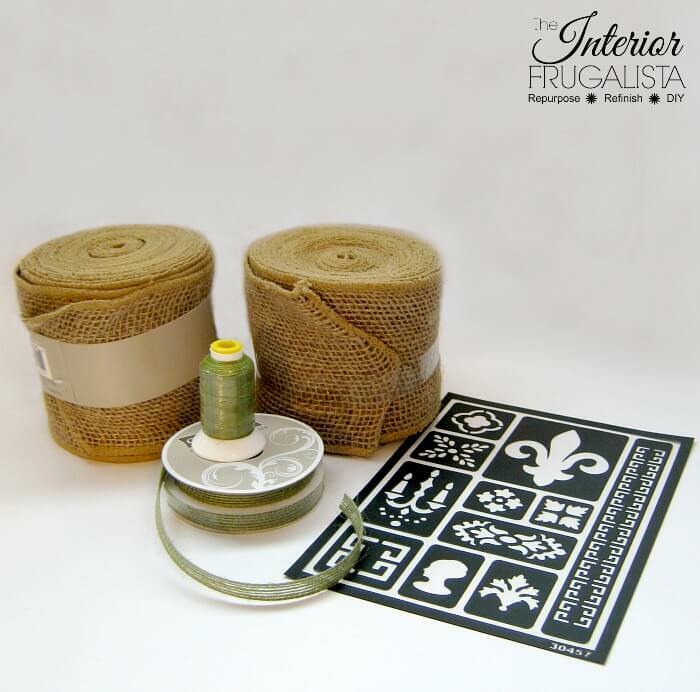 Lay the cut burlap ribbon flat and sew or glue one piece of decorative ribbon on the top facing outwards. 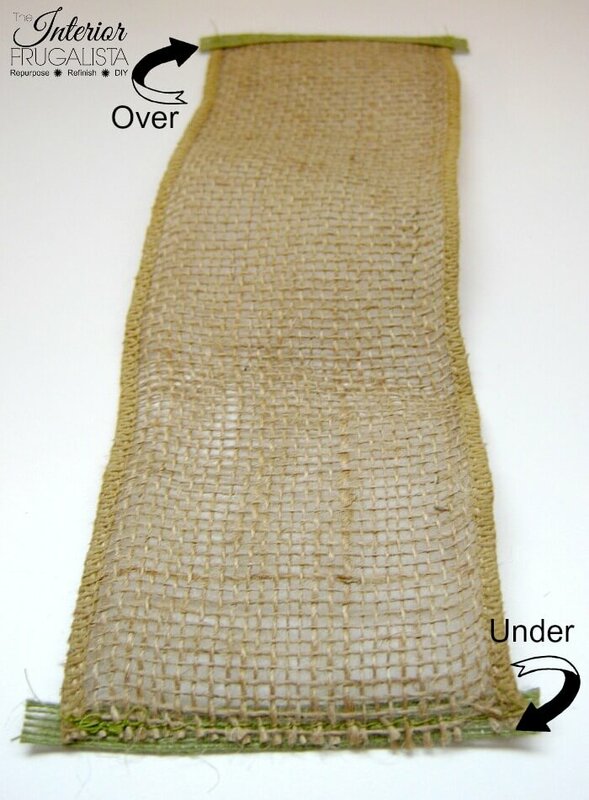 Flip the burlap over and sew the bottom piece on the back side of the burlap (as pictured below). 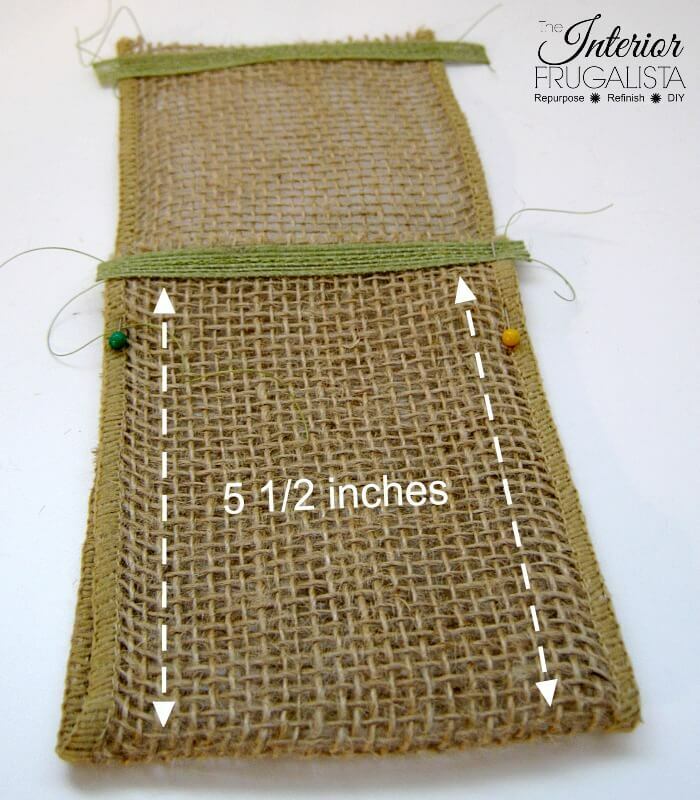 Fold the bottom half of the burlap ribbon over and measure 5 1/2 inches and pin in place. Stitch or glue the sides of the cutlery holders together along the factory edge with either matching thread or a contrasting color like I did. Mine matches the color of the green jute ribbon. 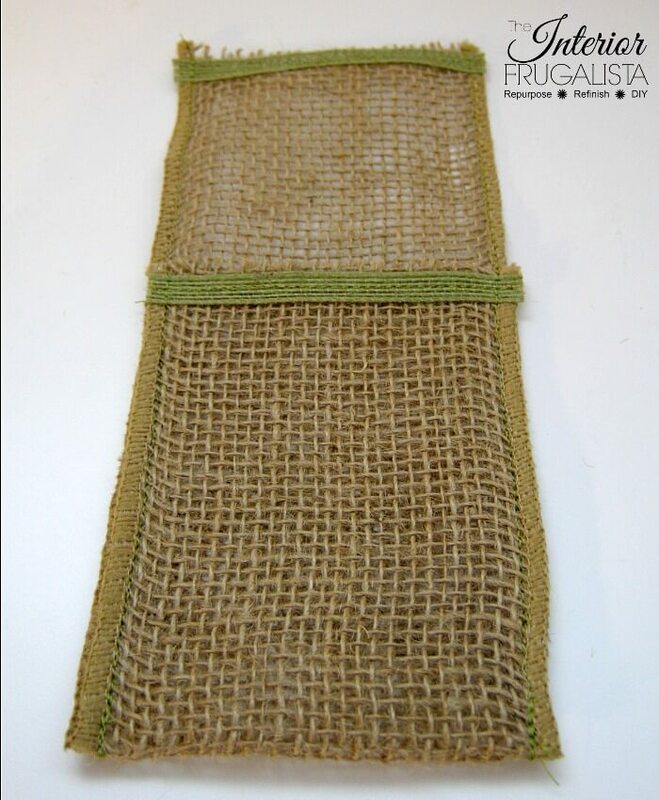 Trim the decorative ribbon, any loose threads, and strands of burlap. Here is one complete set of eight finished. Now time to decorate the cutlery holders with a stencil. 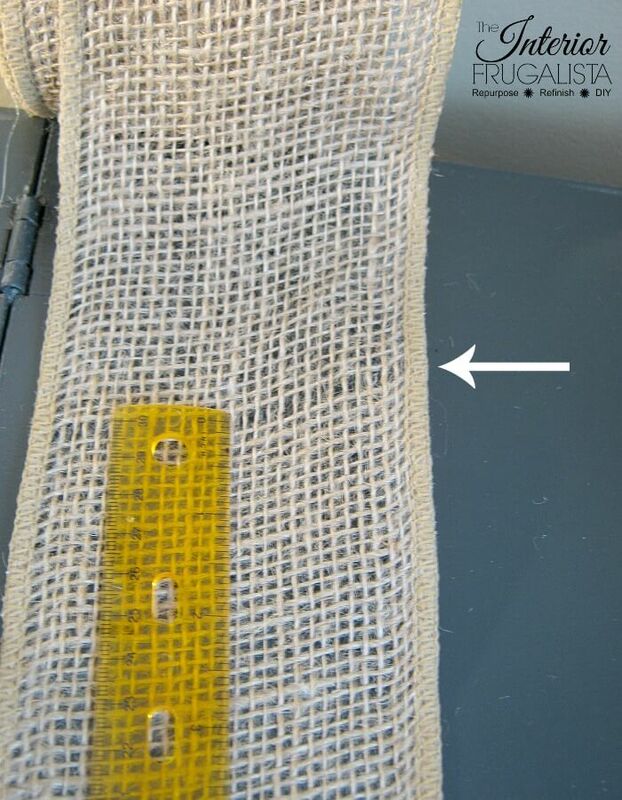 Slip a piece of paper inside each pouch so the paint doesn't seep through to the back. You could stencil the cutlery holders before they are sewn together but I found it easier to line up the stencil after they are sewn. Place the self-adhesive stencil onto the center of the front of each cutlery holder. You don't have to use adhesive stencils but I found it much easier if you do. A regular stencil with stencil spray adhesive certainly would work too. Place some multi-surface or fabric paint onto a paper plate. Load just a little paint onto a stencil brush and offload onto a paper towel until the brush is almost dry. The key is having very little paint on the brush. Pounce the paint over the stencil until it is dark enough to your liking then move on to the next cutlery pouch. 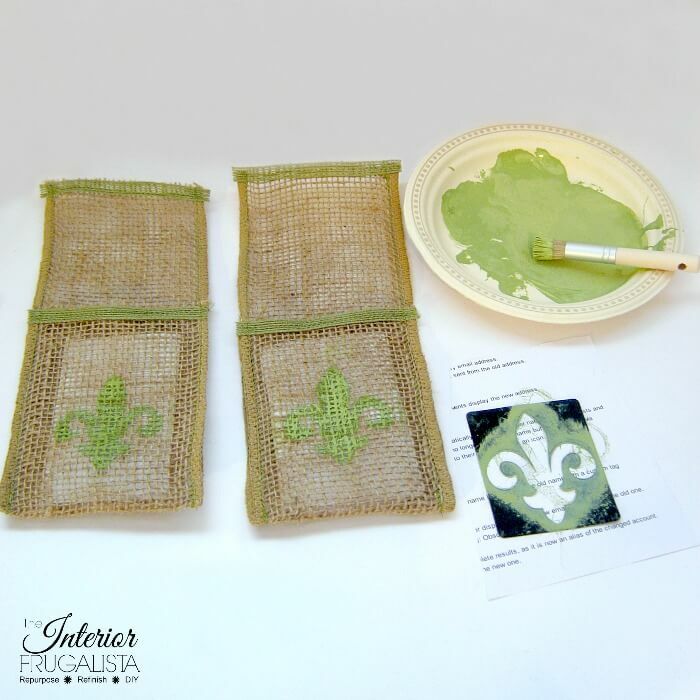 I used a French Fleur De Lis stencil which really isn't Spring but the color I stenciled them certainly is. 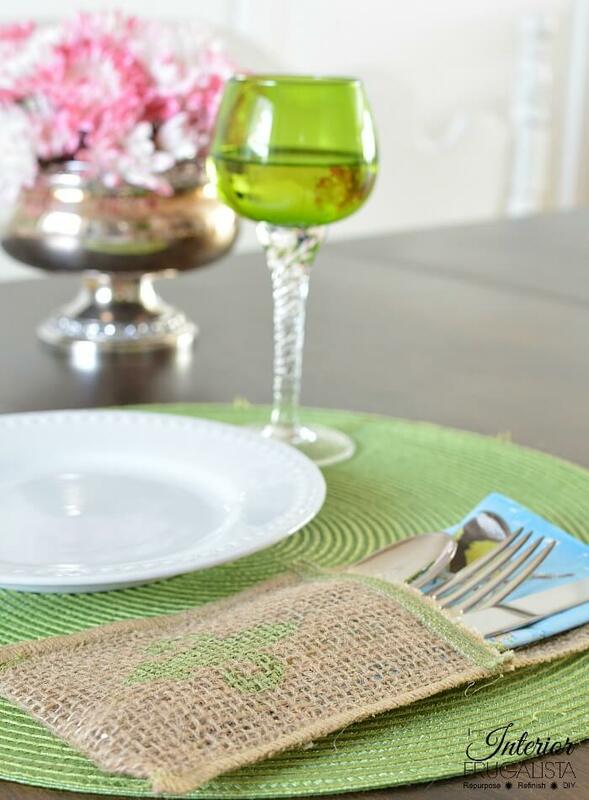 The color matches my woven placemats which I use for both Spring and Summer. A bunny silhouette stencil with a pompom tail would be adorable for Easter. Like I said, the possibilities are endless for decorating these cutlery holders. Here's another idea to dress up your dining room for Spring or Easter. Turn plastic or metal charger plates into adorable round chalkboards. Here's a fun and inexpensive centerpiece idea for Spring. Turn dollar store glass vases or domes into adorable DIY Glass Cloches with furniture knob handles. The possibilities are endless for what you display under the glass. So what do you think, any ideas of how you would use these cutlery holders? What would you use to make them? I'd love to hear your ideas. Super cute idea Marie! Love your spring table styling! This is beautiful. It is indeed inexpensive and easy to make. This tutorial is awesome. 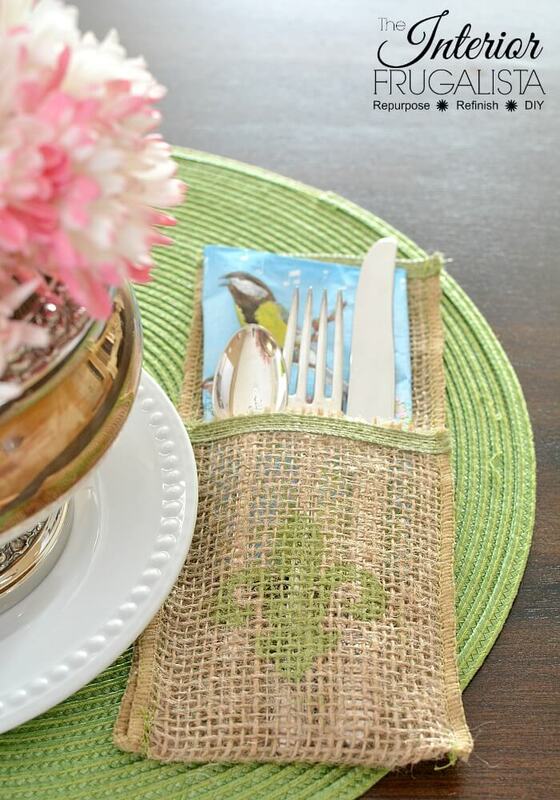 I liked the Spring cutlery holders with burlap ribbon. Thank you so much! 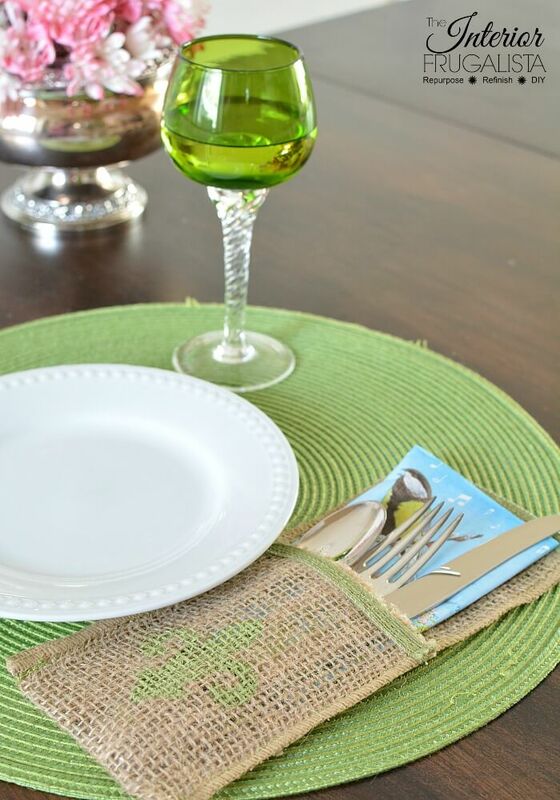 They are very handy and a nice way to dress up the dinner table. What a cute project! I'm stalled on my hand crocheting and loom knitting. I may have to give these a go. It might re-awaken the crafty side. 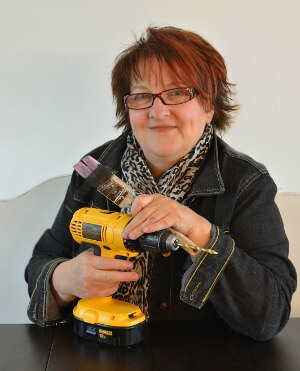 Thank you Julie, I'm glad you like the burlap cutlery holders! The green is a perfect compliment to the green accents in my dining room. I use these for both Spring and Summer. So cute!! And so many ways to take it to a different level. Love these, Marie! Exactly Michelle, so easy without the hassle of cutting fabric - my kind of sewing! 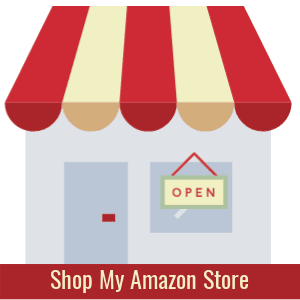 Yes, they would make lovely house warming gifts or hostess, Mother's Day and shower gifts.